Here, your care is your choice. Blessed Home Health Care Agency, LLC is a provider of home-based skilled care services to the residents of Ohio and Michigan. 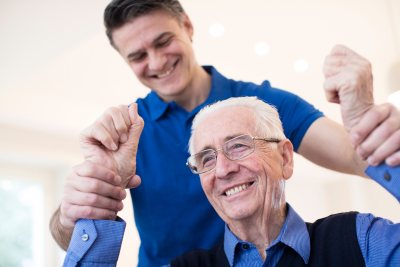 As an alternative to a residential care setting, our company was established to address the various healthcare requirements of our clients in their community. Choosing a senior care agency for your loved ones can be tough as it would affect your decisions as a whole. Of course, you will have to weigh out your plans and consider a lot of factors in mind to ensure wellness and safety. And we are here to give you confidence in every home care decision you make for you and your family. We are committed to meeting and exceeding the care expectations of our clients and their family members as we aim to be the top choice for home health care. We are an acknowledged home health care provider throughout the areas of Ohio and Michigan. We are licensed to operate nationwide. We are awarded by health organizations and accrediting agencies. We have a team of dynamic and registered healthcare professionals who are well-experienced in their field of expertise and specific professions (Nursing, Custodial Care, Therapy). All of our services have passed the certification and recertification of standards set in the State of Ohio and Michigan. We consistently evaluate our services and the professionals who deliver them to you. Our standard assessments show our performance level throughout the term of service. We are highly dynamic as we carefully look at our strengths and weaknesses to serve more individuals with quality and accuracy.